Many bowls greens have problems; its rare for a season to go by with only praise for the green from members. The majority of the problems encountered on bowls greens is directly attributable to the maintenance the green gets and the in particular the maintenance it has had over the years, especially the last 4 decades. This is due in large part to the traditions that have taken hold in bowls green keeping that are wholly inappropriate to maintaining the green in a state of high performance. Foot prints on the bowls green surface; if you regularly leave indentations with your feet on the green surface this is a sign that there is too much thatch building up. Thatch inhibits health by reducing access for oxygen into the green surface. Thatch also harbours fungal disease spores and can be a precursor to severe localised dry patch outbreaks. Yellowing leaves on grass plants; this is another sign that all is not well with the health of your bowls green and the soil underlying it. Yellowing or chloritic grass plants means that the turf is suffering from a lack of essential nutrients, or that the soil is lacking oxygen which is essential for the encouragement of beneficial soil microbes. There are many other reasons that grass plants could exhibit yellowing leaves, including fungal diseases but all of the possible reasons point to underlying problems with the green’s turf/soil relationship. The bowls green surface is unpredictable to play on; when a bowls green is unpredictable to play on from day to day or from rink to rink; sometimes slow, sometimes fast and with quirky draws this is a sign of underlying problems which could include localised dry patch, excessive thatch and compaction. Green surface looks patchy; again a patchy looking green, which has varying degrees of turf density, bare patches, weeds, moss or other grasses is usually suffering from a lack of soil oxygen and a low soil microbe population. Puddles on green surface after rain; this can be caused by excessive thatch, compaction or localised dry patch which causes the green surface to become hydrophobic or water repellent. Problems such as these cannot and should not be dealt with on a piecemeal basis. All of these problems are simply symptoms of underlying issues. 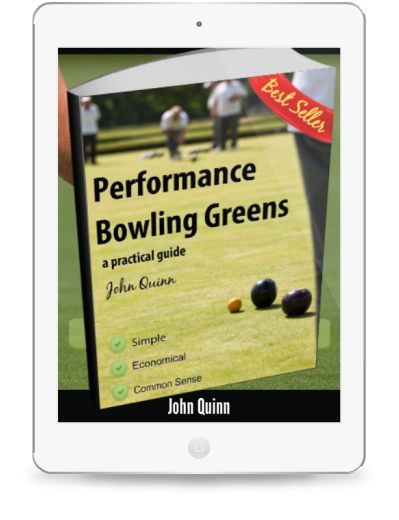 The decline of bowls greens is described in detail here and the answer to the problem is detailed here.